Theme Party Inspiration: A Foxy Thanksgiving — Everybody's Invited! Fox print by Iota Illustration. It looks like the fox has ousted the owl from his position as the au courant creature of the design world. We keep seeing this sly guy everywhere! Clever, crafty, and cute as a button, we just couldn’t resist creating a fox-inspired Thanksgiving theme party dinner. Set the table with these fox plates by Kim’s Little Monsters on Etsy.com. Serve spiked cider in these adorable fox glasses from Modcloth.com. When it’s time to get out your French press and the pumpkin pie, give guests a little surprise with these hidden fox mugs (also from Modcloth.com). Buy or DIY glittery foxes for table decor (pictured fox from Etsy.com). Don’t know what to do with those little leftover Halloween pumpkins? Add some more shimmer to your dinner table by spray painting them with metallic gold paint. Add a warm glow to your dining room with tree branch candles (pictured candles from Etsy.com). We love these simple yellow roses with feathers styled by www.abeautifulmess.com. Put them in a glittery vase and you’re golden! Arrive in thematic style wearing this dapper fox necktie from Etsy.com. 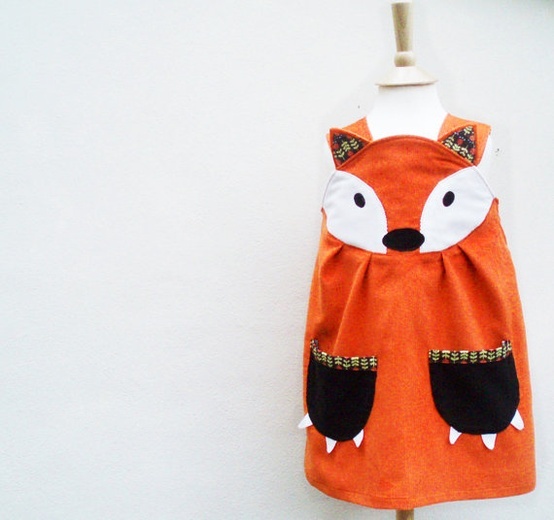 Lady guests will look totally foxy in this dress by Yumi. Pups at the party will have fun in this fancy fox frock from Etsy.com. Have you ever turned Thanksgiving into a theme party? If not, would you? Happy (almost) Thanksgiving from Everybody’s Invited! And thank you so much for reading our little blog. We are truly grateful!